Gig Harbor Marina & Boatyard hauled out a bit of local history recently – or a replica of it, anyway. 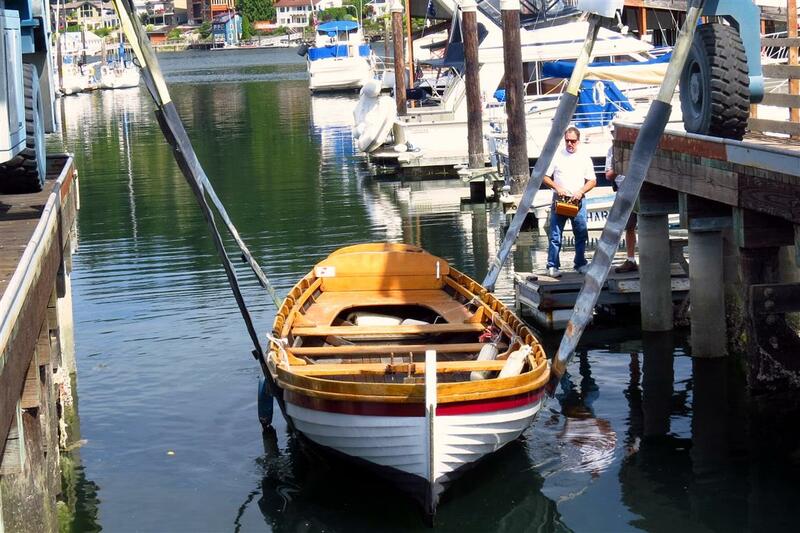 In the spirit of community service Gig Harbor Marina & Boatyard offered the services of its Travelift to haul out the 26-foot longboat, Porpoise, the replica of the gig that was used when Gig Harbor was discovered, and consequently named, in 1841. 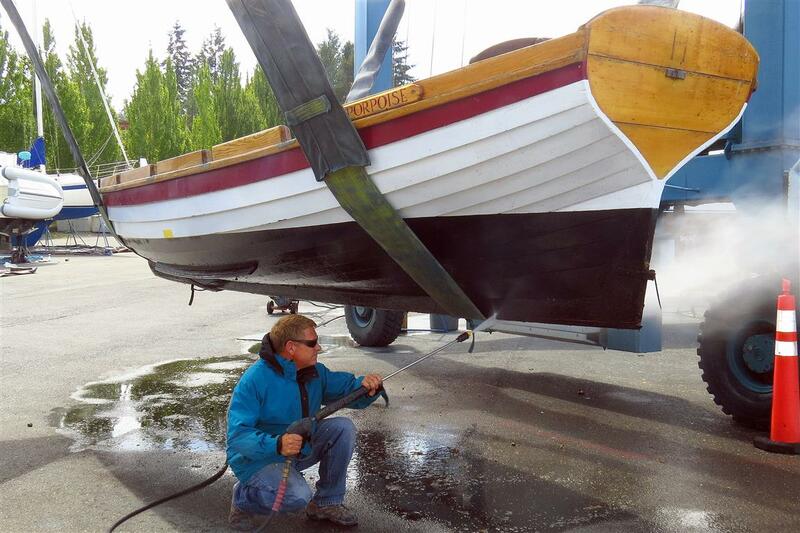 The Porpoise was due for its yearly inspection by the Coast Guard and Gig Harbor Marina & Boatyard, the only full service haulout marina in town, was the logical choice for the owners of the wooden longboat. The boat is owned and operated by the Gig Harbor BoatShop, which currently uses the double-masted rowing gig for community programs, educational programs for youth and for corporate team-building, says John Humphrey, community development director for the BoatShop. “We needed to have the boat hauled in preparation for inspection for its operational permit and to have general maintenance and brightwork done,” said Humphrey. In fact, her return to Gig Harbor Marina & Boatyard is somewhat of a migration back home, since the downtown Gig Harbor marina is where the Porpoise was launched 25 years ago, McDonnell pointed out. The replica of the small survey gig that found the mouth of the harbor was the culmination of a year-long fundraising drive for the Washington state centennial in 1989. These stable, versatile survey vessels were prized for their shallow water, but also beamy and stout enough for the open ocean, said Nigel Davey of the BoatShop. He was on hand at Gig Harbor Marina & Boatyard as Travelift operator Mark Rybin carefully maneuvered the Porpoise out of the harbor and onto the boatyard. The cedar plank on oak frame replica was built in 1989 at the main display hall of the original Washington state museum as their premier centennial exhibit, McDonnell said. It was built by shipwright Greg Foster of the San Juan Islands out of wood purchased from the son of George Pocock of Husky Clipper rowing shell fame in “The Boys in the Boat.” Stan Pocock sold the team some of his stock of tight grain, old-growth red oak timber that was used to build the eight-man rowing shell that won the 1936 Olympics. After a thorough pressure washed bottom-cleaning by Gig Harbor Marina & Boatyard service and maintenance crew, Porpoise was on her way for inspection so she could be back on the harbor for the remaining warm days of fall.